The parking lot is one of the first things that clients notice about your business. It is important to always ensure that your parking lot remains in a pristine condition at all times. Of course, an asphalt parking lot can wear down over time and may need a few repairs. Contacting a professionally licensed company in Tampa that specializes in asphalt repair services will ensure that you receive the best services available and that you will be well-satisfied with the finished product. 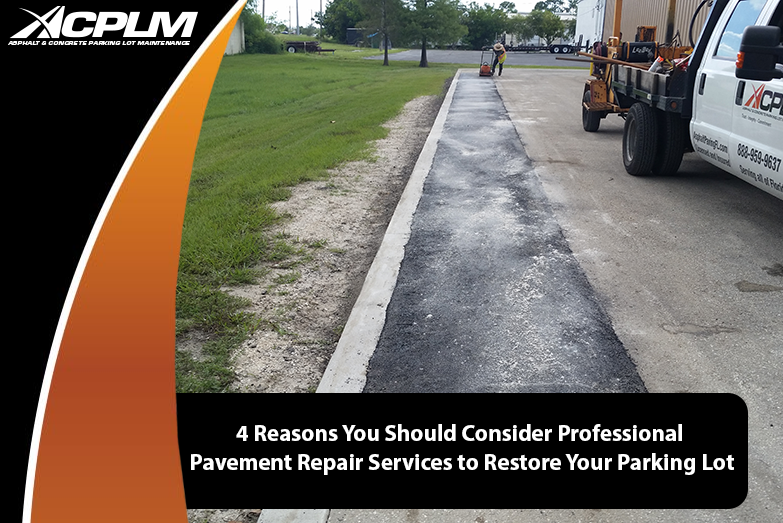 Here are four reasons why you should consider pavement repair services for your parking lot. The time of the year plays an important role when determining how to repair your parking lot. The spring and summer months are typically the most ideal time of the year for parking lot repairs. Trying to seal cracks in a parking lot during the winter time isn’t ideal and it is better to wait for warmer temperatures for the best results. It is always a good idea to contact a company that offers paving repair services if your parking lot has many cracks or potholes. These cracks can develop into even more serious issues if they are not repaired. Eventually, these cracks result in more expenses for your company. Potholes can damage vehicles, as they are a significant liability for any business. Repairing cracks and fixing potholes with asphalt patching in a timely fashion is the best decision for your parking lot. It will ultimately save you a significant amount of money in the future. Another important reason that a business should consider contacting a pavement repair and maintenance company is for their parking lot’s aesthetic appearance. The curbside appeal of your business plays an important role in attracting new clients. A top-quality parking lot is an excellent way to gain new customers. However, failure to take care of your asphalt parking lot can severely damage the appearance of your business and make it much more difficult to reach new clients. The vast majority of businesses set their budget at the beginning of the year. It is important to budget enough money to afford the necessary pavement repair services. Planning beforehand is an excellent way to avoid going over budget, allowing you to find the best deal for repairing your parking lot. Of course, contacting various pavement repair companies will allow you to get the best deal for your company. Choosing to use asphalt repair services for your business is essential, as it will significantly enhance the curb appeal of your building and allow you to reach more clients. Of course, factoring in all of these considerations before you choose a parking lot repair company is always a good idea to ensure that you get the best deal that fits your budget. ACPLM has over 50 years of combined experience in pavement repair services. We strive to always meet the high expectations of each client by providing top-quality services. We always focus on delivering the highest quality customer service available.